Don't die unless you make some efforts to see Paradise in the next world. And how do you make that effort? Dear readers, of all of the Surahs in the Glorious Quran, Surah At-Tawheed (also known as Surah Ikhlas) is one of the shortest and it contains the most benefits. This Surah was revealed in Makkah and it has 4 verses. It is regarded as the essence of the Noble Quran and even one recitation of it per day can bring plenty of rewards. Its recitation is compared to reciting a third of the Noble Qur’an. Sincerely reciting it once is a means of blessings for the reciter. If Surah At-Tawheed is recited more than 10 times each day, the reward will be immense in the Hereafter, InshAllah. There are believers who love to recite this Surah more than 100 times a day. May Allah (The Greatest) bless them. Indeed those careless minds who have never bothered to recite Surah At-Tawheed even once in their lives are the most unfortunate ones. May Allah Almighty protect us from such misguidance and ignorance. Surah At-Tawheed has tremendous importance, and its deeply Monotheistic meaning is so beautifully worded that it is considered improper to recite it in one breath. It must be recited slowly, by following every single word that's recited. This lovely Surah is recited during times of distress, illness, travelling and just about everyday for the purpose of peace, security, happiness and most importantly, for the love of Allah, The Most Merciful. SubhanAllah, what a lovely post and how profoundly important. Indeed how unfortunate are those who have never recited this tremendous Surah. It is the gateway to Paradise. I need to recite Surah At-Tawheed everyday several times in all months. Many thanks sis. Hope fasting is going well at your end. Ameen .... may Allah accept our recitation of this very, very, very important Surah. Surah Tawheed is the center of the concept of Monotheism. O Allah! keep making us recite this Surah till the very last day of our lives, ameen, ameen. Beware of a new FALSE propaganda started by Christian fundamentalists by attacking Surah At-Tawheed (The Unity, also known as Surah Ikhlas or The Purity) - 112th Surah of the Glorious Quran. The attackers of Islam, which include many hardline Christian missionaries and clerics, have started another mischief to misinterpret the Glorious Quran with a grossly false story constructed by them to make it resemble their own ideas of non-Monotheism which they have personally introduced into their own faith. It only shows their deep ignorance of the Quran, the profound ignorance of their own minds and their utter lack of knowledge of the Arabic language. This time, these manipultive spiritual vandals have targetted Surah At-Tawheed (112th Surah) of the most Glorious Quran with their evil by completely misinterpreting the word "Ahad" which appears in Surah At-Tawheed and conveys the meaning of "One and Only" or "One and Unique." Their false propagation claims its meaning to be 'anyone' or 'one of many.' They barely even know the Arabic alphabets correctly, yet claim that the term "Wahid" means 'one' and "Ahad" doesn't. It's the meanest, the most wicked and wilful lie that's being propagated in some websites by certain groups of Christian fundamentalists who are striving to discredit Islam by making it look un-Monotheistic and similar to their altered Christianity. Their purpose is to pacify their own jealousy and low self-esteem which they have been experiencing by altering and making a mess of Christianity. Thus, they have devised this dirty trick by attacking the Great and Beautiful Surah Tawheed (The Unity) which is the essence of Monotheism (or Tawheed) throughout the universe, and is the confirmed cornerstone of the ideology of Tawheed. Since falsehood cannot survive, Allah Almighty has made it very easy for us to expose this lie by the kufaar. We will analyse the grammar of Surah Tawheed, word by word. First, the following is the original Surah Tawheed in Arabic, followed by its translation in English. Say: He is Allah, the One and Unique! To begin with, it must be known that the Arabic term "Ahad" is strictly singular, and strictly superlative. Its literal meaning in English would be 'One' and it denotes the ideology of the highest order, or the highest quality, or the highest degree, surpassing or being superior to everything else. "Qul huwa Allahu ahad" - the translation to convey the actual meaning of this Verse is: "Say: He is Allah, the One and Unique" or " .. the One and Only." The explanation of this is: there is none like Him, or there is no one like Him or there is not anyone like Him. Therefore, Verse 112:1 automatically brings the meaning of being matchless or peerless or above comparison. "Walam yakun lahu kufuwan ahad" - the exact translation of this Verse is: "And there is none comparable to Him." The explanation of this is: there is none like Him, or there is no one like Him, or there is not anyone like Him. If this Surah is read with a bit of attention, one will realize that there is no need to even consult a dictionary to learn the meaning of the term "Ahad," because this term is explicitly defined and explained within this Surah itself. Please note, the term "Ahad" is even more singular than the word "Wahid." "Wahid" simply means 'single.' Grammatically it can also be written or spoken to refer as single in a particular era or society or country or planet, depending on the context and the construction of the sentence. But "Ahad" literally means 'First and the Last' with no scope nor any range to change it .. expressing a thing that is, was, and will be unmatched and uncomparable. This Arabic term "Ahad" is the most beautiful and glamorous singular expression contained within a single unit of the Arabic language, the true equivalent of which cannot be found in any other language. It is the most accurate, precise and perfect term to describe the true and One Monotheistic God. Praise be to Allah, The Almighty, the One and Only. Very nicely written sister Heba. Great analysis, so beautifully expressed. Indeed only the Truth survives. Alhumdulilah. I didn't know these christian fundamentalist morons had started this type of utter nonsense. What next will these calculating rogues be upto? And indeed such creatures will keep drifting further and further from the right road until death overtakes them and then .... straight to Hell , all of them! Many thanks for this beautiful and very, very important post, dear sister Heba. This inflated nonsense by fundamentalist christians is another one of their tantrums and manipulated scheme devised with the purpose to satisfy their desire of pluralizing the strict Islamic doctrine of Monotheism or Tawheed. Thus, Allah warns in Verse 31:33 not to let the deceiver beguile you. They have desperately been trying to misinterpret the term "Ahad" by claiming that it means "one of" and not "One." The reason for this mischief is to portray Islam as not being totally Monotheistic and to create a similarity with the altered Christian polytheistic concept of trinity. These christians also falsely propagate that "Ahad" is a Hebrew word. Completely false! "Ahad" is the purest of Arabic word. To claim that the word "wahid" means "one" while "Ahad" means "one of" only exposes their staggering depth of profound IGNORANCE of the Quran and the Arabic language. The term "Ahad" puts total emphasis on singularity, even more than the term "Wahid." You are absolutely right that it connotes a superlative, referring to "The Only One," "first," "unparalleled," "unequalled," "unique" or a matchless unity which is precisely what Surah At-Tawheed confirms. Those Christian kufaar at 'answering-Islam' website are one of the retarded lunatics who started this defamation campaign. It seems that they have a lot of time to waste on thoroughly illogical gossips. And by doing so, they are shamelessly proving to the whole world how little they know about the Noble Quran. Such a propaganda is a stark evidence that they have never studied the Quran, let alone trying to understand it. They have only picked up a few lines of the Quran for the sole purpose to attacking it with manipulated lies and slander. First of all, their slander proves that they haven't even studied Surah At-Tawheed. As sister Cat rightly stated, a slightly careful study of Surah At-Tawheed will let us know that we don't even need to consult a dictionary to learn the meaning of the term "Ahad" because the meaning is most clearly defined within the Surah itself. But the Christian fundamentalists neither have the brains nor the decency to understand the four most eloquent and articulate Ayats of this beautiful Surah and the cornerstone of Monotheism. Furthermore, anyone who has read the Noble Quran fully even once will be well aware of the great emphasis the Quran puts on the concept of Monotheism or Tawheed. Every page of every Surah highlights the vital importance of Tawheed, and rejecting it is an unforgivable sin in the Hereafter. Let me quote a few of the many Quranic verses that categorically assert the huge importance of Tawheed which is indispensible for acquiring Salvation. I hope Christian readers study, understand and embrace Surah At-Tawheed and the following Ayats of the Noble Quran before they die, otherwise they can only expect to fry forever in Hellfire from the Day of the Tryst onward. These bloody christian fundamentalists have completely lost their minds. If only they knew how foolishly they are wasting their time with such childish and pathetic lies that get blown away into hellfire even before they are contrived. JazekAllah Khair and thanks dear sisters for your excellent contributions. Allah Almighty is always with the truthful. 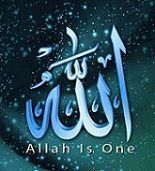 There is no god but ALLAH, the One and Only. Allah-o-Akbar! Thank you very much sister Ruhi. I deeply appreciate your wise and truthful comment. Allah Almighty bless u, dear sister. These christians also falsely propagate that "Ahad" is a Hebrew word. Completely false! "Ahad" is the purest of Arabic word. OMG! How can anyone be so ignorant as to claim "Ahad" to be of hebrew origin? Such lies are deliberate ones. "Ahad" is a very, very Arabic term and beautifully unique. It's a very comprehensive word that really cannot be translated accurately into English or any other language, as you very correctly said. The direct translation of "Ahad" in English would be "One," but the actually sense which "Ahad" conveys is even more singular than "One." That's because the meaning "One" conveyed by the word "Ahad" denotes "One" of its kind in the entire universe. Thus, the real correct meaning is, "One and Only," or "One and Unique," or "One and Matchless." In English there's no single unit word or a monosyllabic word which expresses this meaning accurately. Thanks very much sister Zeynab for your additional clarifications. Very well elucidated. MashAllah. "Ahad" is a very, very Arabic term and beautifully unique. It's a very comprehensive word that really cannot be translated accurately into English or any other language, as you very correctly said. The direct translation of "Ahad" in English would be "One," but the actually sense which "Ahad" conveys is even more singular than "One." That's because the meaning "One" conveyed by the word "Ahad" denotes "One" of its kind in the entire universe. Thus, the real correct meaning is, "One and Only," or "One and Unique," or "One and Matchless." In English there's no single unit word or a monosyllabic word which expresses this meaning accurately.